Here's a set of aerial views from Flickr user dnskct, taken over Wyoming in November, 2008. 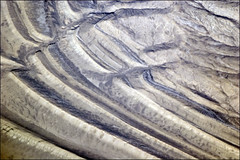 The first image shows the folded ridges of the Haystack Mountains in northern Carbon County, Wyoming. 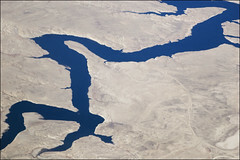 About 13 miles east, the next image shows the southern portion of the Seminoe Reservoir on the North Platte River in Carbon County. 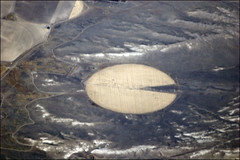 The final image shows a close-up of a center-pivot irrigation field in Platte County, Wyoming, about five miles southeast of the town of Wheatland.